Samsung S9 4K Ultra HD TV now on sale in UK | What Hi-Fi? Samsung and UK retail store Selfridges have unveiled the Samsung S9 85 inch 4K Ultra HD TV, to be sold exclusively at Selfridges' flagship Oxford Street and Birmingham stores. Spotted at CES in January, the S9 4K UHD TV is now available on UK-shores for an eye-watering £35,000. As well as offering the 4K Ultra HD resolution (that's 3820 x 2160 pixels) the S9 (S9000) also comes with the company's Smart Evolution technology, allowing owners to upgrade their TVs to suit current and future technologies. 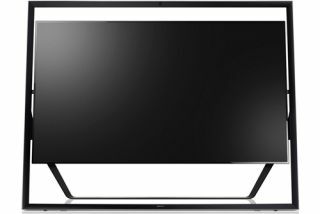 Announcing the release of the TV, Richard Jones, Selfridges' Technology Buying Manager commented that the Samsung S9 "is the world's first Future Ready UHD TV, the quality and design breaks new boundaries in the world of HD TV. "Our customers expect the latest and finest technology for their homes and personal use. We hope to pioneer the way forward in the latest releases and Samsung is exactly this." The Samsung TV follows in the footsteps of the Sony KD-84X9005 84in 4K TV and the LG 84LM960V 4K TV. For those with money to burn, the Samsung S9 4K Ultra HD TV is availble now. UPDATE: The TV has now been joined by 55in and 65in 4K TVs from Samsung.